Clinicians do not currently have a reliable way to predict which patients treated for hormone receptor-positive (HR+) breast cancer run the risk of a late recurrence. A recent study, published in JAMA Oncology, suggests that a blood test – a type of liquid biopsy – has the potential to classify patients according to their risk of recurrence. The researchers found that women who had cancer cells detected in their blood stream five years after the original diagnosis were 13 times more likely to experience a recurrence than those who did not. Kathy Miller, the principal investigator from Indiana University, stated: “This finding is not something that should change practice now. But it gives us the potential for future clinical trials that identify patients at higher risk [of late recurrence] and study whether having that information could change treatment and improve outcomes.” Lindsay Harris of the National Cancer Institute in Bethesda, Maryland, who was not part of the clinical trial, commented that this was a well-conducted study and the findings were really important. Although malignant tumours are solid masses, they are not static. 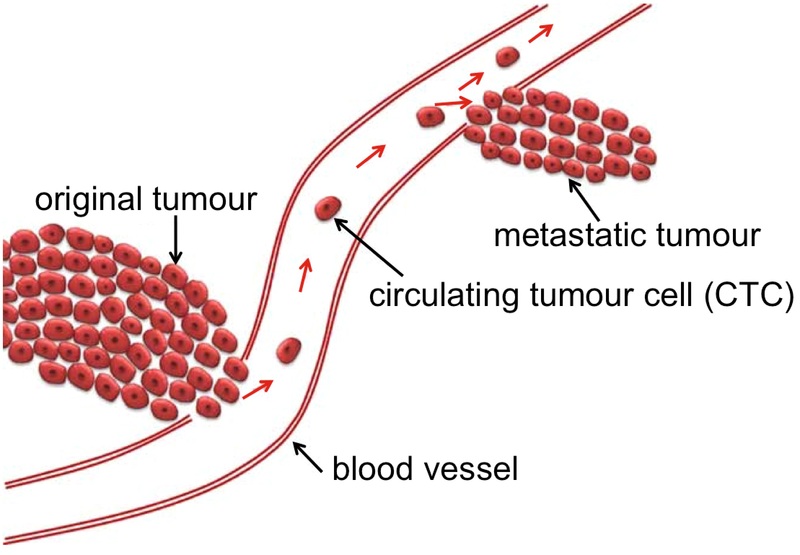 They grow, spread and modify the surrounding environment, shedding cancer cells into nearby blood vessels (see diagram at left). By measuring and analysing these circulating tumour cells (CTCs), it may be possible to discover vital information about the tumour that could be used to benefit the patient. Liquid biopsies, in which DNA in the blood is measured, are now being widely studied to improve the early detection of cancer, to monitor progression of the disease and to guide treatment. Miller and her colleagues analysed blood samples from 547 women and 26 of them had at least one detectable CTC. There were no major differences in characteristics such as tumour size, age at diagnosis, or proportion with HR+ breast cancer. At a median follow up of 2.6 years after the test, cancer recurred in 24 women, 7 of whom had detectable CTCs and 17 who did not. This represented a 13-fold higher risk of recurrence for women with CTCs. The research team acknowledged that their study population was limited in size and the follow up period was quite short. In future they plan to evaluate other tumour biomarkers – such as blood proteins – that could be predictive of recurrence to explore whether they can do an even better job of segregating patients based on risk. As Harris concluded, having a test to predict which HR+ patients are most at risk could determine the optimal treatment options.